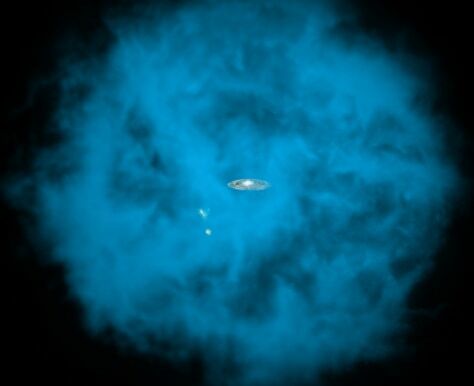 This artist's illustration shows an enormous halo of hot gas (in blue) around the Milky Way galaxy. Also shown, to the lower left of the Milky Way, are the Small and Large Magellanic Clouds, two small neighboring galaxies. The halo of gas is shown with a radius of about 300,000 light-years, although it may extend significantly further.